Fun Fact: Meticulousness runs in the family: his mother was a tailor, his father an auto mechanic. A watchmaker to the stars shares the wonder of mechanical watchmaking. When Steven Richardson saw news coverage of the unrest in Baltimore after Freddie Gray’s death, he thought it was time to come home. He knew he could do something positive for his native city, just as he had done in his adopted city of New York. His path in life had led him from boyhood in Edmondson Village, to art gallery ownership in Federal Hill, to gem collecting in Thailand and Brazil. That path may have been meandering for a while, but now Richardson’s life clicks as precisely as the watches he makes. Richardson started out with silversmithing. He was fascinated by the silversmith’s trade, how someone could take a lump of metal and mold it into something beautiful. Apprenticing himself to a craftsman, he learned how to fashion simple bangles and then more elaborate jewelry, using platinum, gold, and gemstones. Five years later, he traveled to Brazil, where he learned gemology on the job in Rio de Janeiro. It was in Rio that he began noticing watches – Rolex, Cartier, Breitling. When he accidentally doused his watch at Copacabana Beach and took it to a shop to get repaired, he was astounded to see the watchmaker take the entire thing apart and put it back together again. He was hooked. From then on, Richardson began learning the craft of making timepieces by hand. He moved to New York where he worked under a master watchmaker. He went to Geneva, Switzerland, “the mechanized Mecca,” as he calls it. He began studying the history of watchmaking and of Benjamin Banneker, the African-American statesman and mathematician, whom he believes can be an inspiration to young people. 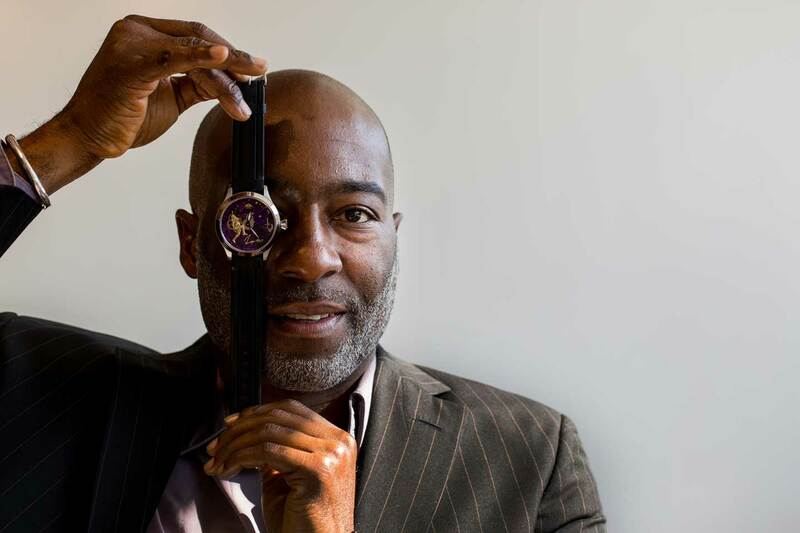 With his company, Art of Horology, Richardson not only creates custom, handcrafted watches, often for celebrities, he also teaches other people how to do it. He started an instruction program in New York public schools, and watched as young students became as enchanted with the work as he was. When they sit at that desk, they’re determined to make that watch work. They transfer their energy into that. A watchmaker sits at a high desk, his chin just above the top, with his tools at eye level. He wears a magnifying glass, called a loop, over one eye. And then he sets to work, manipulating the tiny gears and components in front of him. Richardson offers horology instruction to adults and children, hobbyists and aspiring professionals alike. There are 5,000 watchmakers needed in this country, he says, and he wants to help provide them. It’s a calling for him, a passion.